Recently Depeche Mode swept through Copenhagen on their 2017 World Tour and T-Rex jumped at the opportunity to meet up with Jez Webb, Martin Gore’s guitar tech, to take a sneak peek at how they use our pedals to produce the amazing sound they are known for. By coupling the T-Rex Octavius and Bass Juice analog pedals with the more modern Kemper and Rivera amps they produced an intoxicatingly fat, warm sound. It was particularly exciting to check-out how they were utilizing the FuelTank Power Supplies such as, Classic, Chameleon and Junior based on the amount of juice they need. In this rig rundown, at 13:51, there is a shot of some of Michael Angelo Batio's pedals, and his T-Rex Fuel Tank Jr. can be seen. According to Premier Guitar's rig rundown, Laiho's power supply is T-Rex Fuel Tank Junior. In this photo, T Rex Fuel Tank Junior Power Supply is visible. **Jimi:** Got out the '56 and the vintage MXR pedals out, we must be recording. At 2:50 in this performance of Forever, we can see this pedal. As Rob re-builds what his pedalboard setup is, at 3:02 you can see the T-Rex Fuel Tank jr. In this video Rob and Lee are putting pedals boards together, Lee uses on of these 2:13 is a good view as Lee is putting it on the board. Photo taken by me at the front of a yellowdays concert in brighton at the haunt on the 3rd of may 2018. 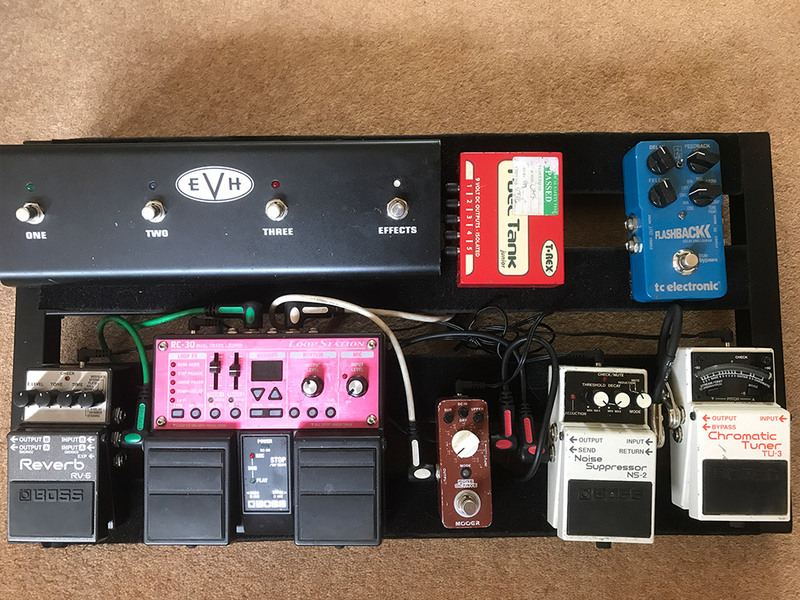 His pedal board can be seen to be holding a few pedals including the fuel tank. The T-Rex Fuel Tank Junior is a power supply for your guitar effects pedals that features 5 isolated 9V outputs (120 mA each) to deliver clean, quiet power to your pedals. This keeps your board free of messy power cables and complicated extension cords, and reduces setup and tear-down times. Don't let the Junior's compact size fool you - this Fuel Tank Junior is a real powerhouse! Fuel Tank Junior comes with 5 DC connection cables, and will power just about any 9V pedal you own. It can also power an 18V pedal by combining two outputs using a special T-Rex Voltage Doubler cable (sold separately). Delivers clean, quiet power for 5 - 9V pedals. Perfect for small-size pedalboards, tiny, powerful and silent... really silent with isolated outputs. This is an isolated power supply in a perfect size, with enough power for a mini pedalboard. I recomend it. To my surprise, this is not regulated. Found out when using Fulltone pedals, that needed this. Truetone One Spot is the one you need. For the money this is one of the best small isolated power supplies going. not quite a CIOCKs but about half the price. great for small boards. quiet. If you have a few pedals, have enough money and want a very good power supply, this is, for me, the best option in the market.